reign, John Walker & Sons produced the Diamond Jubilee. There’s only a limited edition of 60 bottles available for sale. Each decanter is priced with an incredible value of $156,000. It’s the whiskey inside the decanter that justifies the price as it’s a special blend of grain and malt whiskies, all distilled in 1952 – the year Queen Elizabeth acceded the throne. All the profits will be directed to a royal charity, the Queen Elizabeth Scholarship Trust, which supports British craftsmen and women. 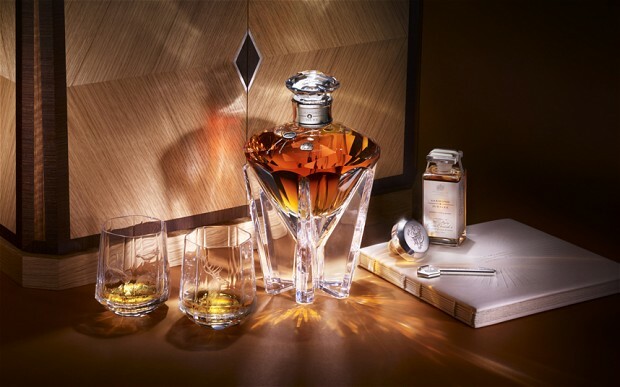 The crystal diamond-shaped decanter from Baccarat is enclosed in a cabinet which has been made with wood from two of the Queen’s estates. Hamilton & Inches has fashioned the collars set with a half-carat diamond and each crystal decanter is accompanied by two hand-engraved lead crystal glasses.